PORTSMOUTH — Photographer Emily Brackett said the timing was just right to open her downtown store, Live Free Photography. Hours: Every day except Wednesday, 10 a.m. – 6 p.m.
Brackett originally opened her store in Newmarket, but wanted to be in Portsmouth. A native of Portsmouth, she lives in Newmarket. Originally a major in fashion design at an art school in Massachusetts, Brackett said she found it wasn’t what she was looking for in a career. She worked at a camera store in Dover, exchanged cameras at the now defunct Eagle Photo and worked in photo labs. Through these jobs and her love of photography, she knew what was needed. One thing people appreciate is being able to transfer their slides and old photographs to a restored state that will survive time, she said. 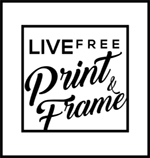 Live Free Photography offers a wide range of services and supplies. Photo restoration is a big part of the business as is printing photographs on canvas. Brackett transfers home movies to DVD, 16mm, 8mm, Super 8, VHS and more. A full line of photo supplies is also available, including Kodak, Fuji and Ilford. Another service of Live Free Photography is putting an artist’s work on note cards and/or reproducing it as prints. Already, Brackett has some clients and their art is on display. She also sells a selection of frames and supplies. Brackett said she found a real need for her services when she had her shop in Newmarket. Brackett emphasized she wants people to feel free to walk in and talk to her and get personalized help with their digital camera. Brackett believes people don’t print enough and some print on low quality paper that won’t stand the test of time. “It’s nice to put a photo album out and be able to look at it without standing around someone’s computer screen,” she said. While Brackett admits to some concerns about the current economic situation, she is confident her move to Portsmouth was right. In addition to her client services, Brackett’s own work is displayed on the walls of her store. “I’m very happy to be able to put my past experience to use now,” she said.